Global Awareness Accessibility Day (May 17th) 2018 saw the launch of the ‘Digital Accessibility Toolkit’by the international Christian development organization CBM. 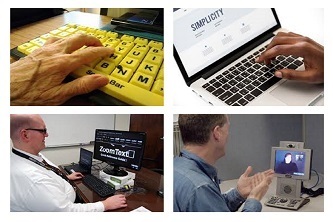 The toolkit relates to the accessibility and usability of Information and Communication Technologies and highlights the importance of digital accessibility for people with disabilities. It also links people to free online training and other resources to assist in ensuring that digital accessibility becomes commonplace. Section 1: This provides a glossary and a list of acronyms which are used throughout the guide. Section 2: This provides a background and considerations such as the key requirements to providing digital accessibility and outlines the importance of accessible Information and Communications Technology for people with disabilities. Section 3 & 4: These sections provide a scan of the available tools and resources to produce accessible content in videos, figures and electronic documents and ways to provide web accessibility. Section 5: This section provides an outline of how to build accessibility into the procurement process. Section 6: This section provides information on self-learning resources and lists some of the digital accessibility initiatives around the world. Section 7: This section simply includes information on ways to get involved in further discussion regarding digital accessibility. For further details on the toolkit click here.